Smart and modern bistro set. 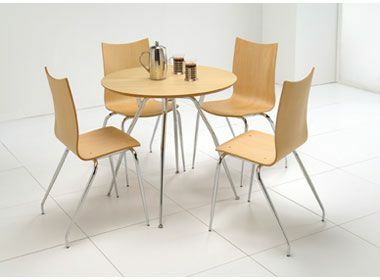 The chair supports your back posture and both table and chairs feature a modern chrome frame and legs. Unique shaped legs for an alternative look. Contemporary style Bistro set with a maple veneer cafe table with a MDF core. The designer chrome legs of the café table echo the legs on the Bistro chairs. The chairs have a sculptured back which adds to the stylish appeal of the Roma bistro set. The Roma bistro sets are held in stock for immediate delivery and are delivered to ground floor location on a pallet. 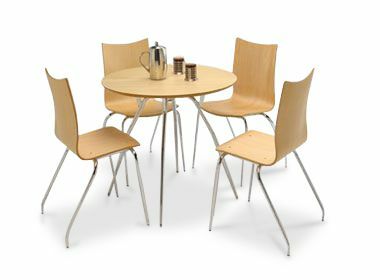 Delivered flat packed for self assembly and designed for use in commercial areas, this is one of our most popular bistro sets.